District » Turners Falls High School » Breakfast News! The academic day begins at 7:45 for high school students; breakfast is served in the cafeteria before school starts and in a grab-and-go format from the cart in the school lobby at arrival time. TFHS students have a 25-minute period each morning that's used for all-school and class meetings, advisory, getting extra help from teachers, clubs, and study hall. 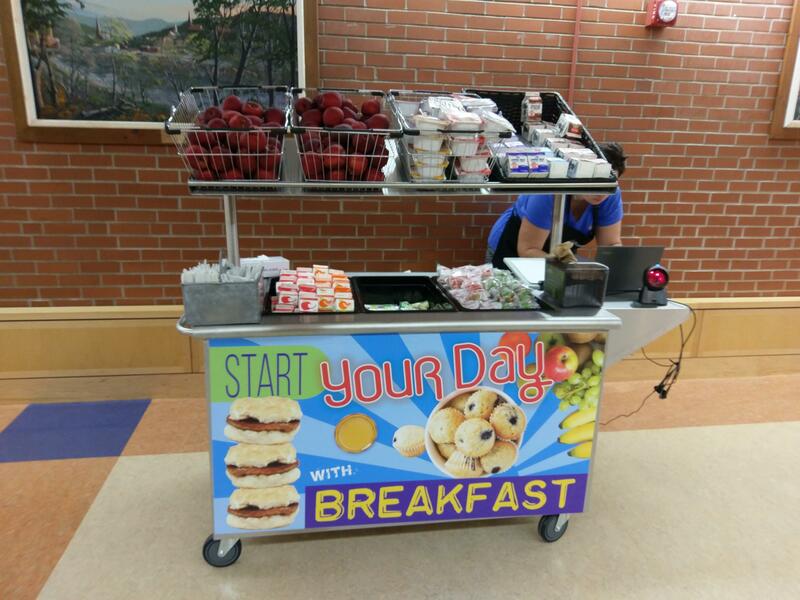 The new thing we're trying involves bringing the cart back out around GAP each day (9:06-9:15 MWF and 9:38-9:42 on Tu and Th), so that students have a second chance to get breakfast ... or a second breakfast ... or just to grab a snack for later. After consulting with the Building Leadership Team, we decided to offer only foods that aren't messy or sticky from the cart. Teachers retain the prerogative to prohibit food in their rooms, either completely, or on a given day for a particular reason. The breakfasts provided will be designed to be able to be packed away if needed. This week before break will be a pilot. We'll be paying attention to whether more students eat breakfast this way, as well as whether students are able to get to GAP/class on time, and if trash/recycling is disposed of properly. We'll be making adjustments and improvements based on what we learn!